A new survey from Gallup revealed that Americans are increasingly bullish on housing as a long-term investment. Earlier this month, the polling company conducted phone interviews with over a 1,000 participants to determine the most attractive investment option out there. Unsurprisingly, real estate was the most favored investment, with 30% of respondents naming it their top choice among four other options. It was followed closely by gold and stocks/mutual funds, both of which snagged 24% of the vote. It dropped off pretty badly from there, with just 14% favoring savings accounts/CDs as their preferred long-term investment strategy, and only six percent going with bonds. Back in 2011, real estate wasn’t yet all the rage. In fact, a lot of Americans were ditching their homes, sometimes voluntarily (aka strategically) to avoid taking a huge financial loss. During that time, the safe haven that is gold was the top investment according to Gallup, with a 34% share. Of course, during that time gold prices were skyrocketing and everything else was taking a bath, so it made sense to select “gold” as a solid investment strategy. Since then, gold prices have come down and both stocks and real estate values have climbed steadily. As a result, gold has fallen out of favor with investors. Before the housing crisis, savings accounts/CDs were the most popular investment choice for Americans, largely because the yields were so high. Today, savers are lucky to get a 1% return on these types of accounts, which explains their recent falling out of favor. Interestingly, as savers lose, homeowners win because low-yielding savings accounts translate to low mortgage rates. That’s been the trend for several years now, though it could finally drift the other way. Breaking down the nation’s love for real estate, those making $75,000 or more felt real estate was the best bet as a long-term investment. In that category, 38% indicated that real estate was the top investment strategy, followed by stocks/mutual funds at 30%. In the $30,000 to $74,999 income bracket, real estate and gold grabbed an even 26% of the responses, with stocks/mutual funds a close third at 25%. Finally, in the less than $30,000 income cohort, gold was tops with a 31% share, followed by real estate at 28% and stocks/mutual funds at just 13%. This could relate to the fact that most upper-income Americans actually own their homes and realize all the associated benefits. For obvious reasons, lower-income Americans are less likely to own homes, which drove their responses elsewhere. 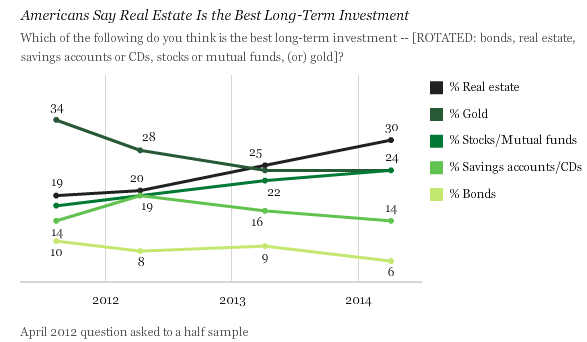 If we break things down by age, those 30 to 49 years are the most bullish on housing, with 34% selecting real estate as the best long-term investment. The youth seem to be taking a more balanced approach, with real estate only a top choice for a quarter of participants, the lowest of all age groups. Still, every single age group listed real estate as their top choice. If we look at political leanings, Independents love housing the most (33%), followed by Republicans (30%) and then Democrats (27%). In fact, Democrats favor stocks/mutual funds over real estate. Take this survey with a grain of salt though…it always seems to lag what’s really going on. By the time the real estate market implodes again, it will probably be at an all-time survey high. Go figure.